Access to the dam across the closed section of the Valley Track is now in place. The map below has been modified to reflect this. The track disruptions described below are likely to be in place until May if works progress as expected. Movement along the Tully Boundary Track should remain possible for the duration of the works. Progress of the pipeline installation has been rapid, with several hundred meters already laid within the Reserve. For users of the Reserve this means the closure of portions of tracks that are part of the pipeline route. Note that the Tully Boundary Track west of Deep Creek will be kept open at all times. There are three main disruptions, described in detail below: Closure of the track from just west of the dam down to where the Boundary Track crosses the creek; closure of a small section of the Valley Track west of the dam; and disruption of access to the dam. Updated information about disruptions to access will be available on this page as soon as fotpin is made aware of them. For more information and background on the pipeline, see previous updates (currently not optimized for small smartphone screens). 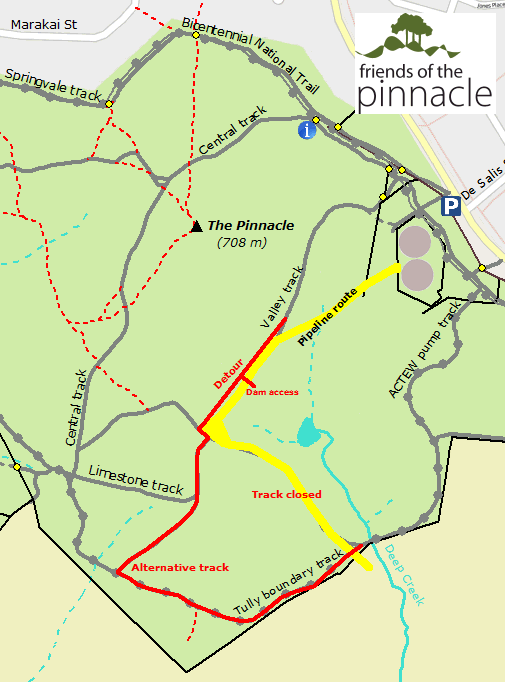 The major disruption caused by this is that the track from just west of the dam down to where the Boundary Track crosses the creek (highlighted on the map below as track closed) is now closed to Reserve users. 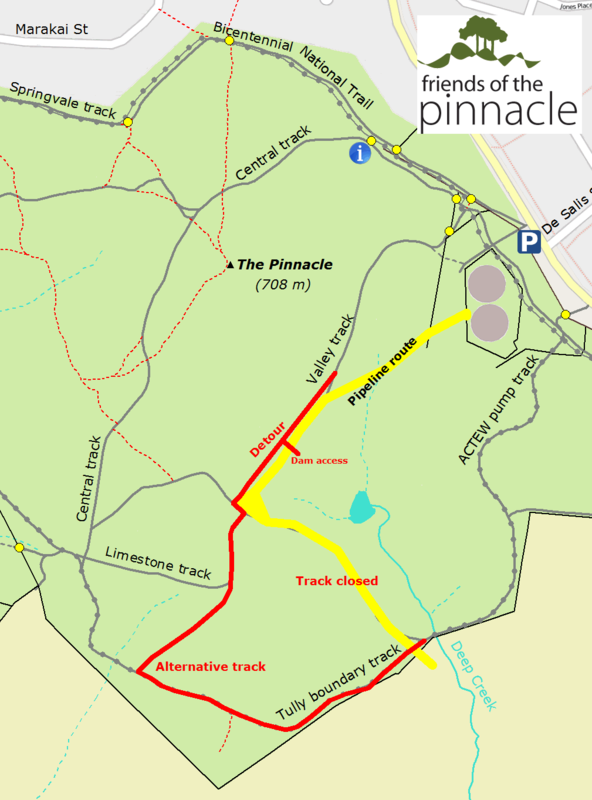 This means a long detour for people who had planned to complete a loop using that track and the ACTEW Pump Track. An alternative route is shown on the map below. A more minor inconvenience is the closure of the track to the north of the cross roads where the pipeline does a sharp right bend. The contractors have created a track a few meters wide that skirts around the western side of that closure, shown on the map below as Detour. At the moment it is quite suitable for pedestrians and they intend to keep the grass flattened or cut as necessary so that it remains so. At the moment, access to the dam from the tracks to the west of it has been disrupted. We are currently seeking further information from the contractors about this and will update this page when there is more information.